October 31, 2017 – When NASA’s Mars Pathfinder touched down in 1997, it had five cameras: two on a mast that popped up from the lander, and three on NASA’s first rover, Sojourner. That same evolution has returned to space. NASA’s Mars 2020 mission will have more “eyes” than any rover before it: a grand total of 23, to create sweeping panoramas, reveal obstacles, study the atmosphere, and assist science instruments. They will provide dramatic views during the rover’s descent to Mars and be the first to capture images of a parachute as it opens on another planet. There will even be a camera inside the rover’s body, which will study samples as they’re stored and left on the surface for collection by a future mission. Enhanced Engineering Cameras: Color, higher resolution and wider fields of view than Curiosity’s engineering cameras. 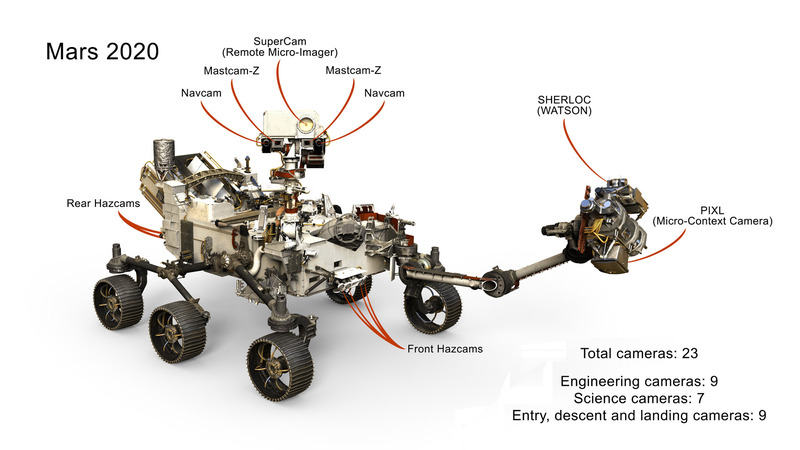 Mastcam-Z: An improved version of Curiosity’s MASTCAM with a 3:1 zoom lens. 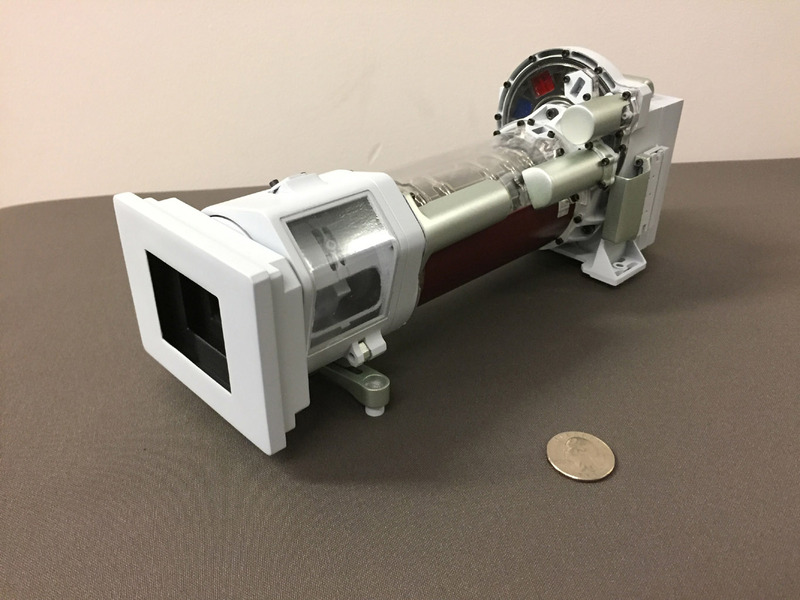 SuperCam Remote Micro-Imager (RMI): The highest-resolution remote imager will have color, a change from the imager that flew with Curiosity’s ChemCam. CacheCam: Will watch as rock samples are deposited into the rover’s body. Entry, descent and landing cameras: Six cameras will record the entry, descent and landing process, providing the first video of a parachute opening on another planet. Lander Vision System Camera: Will use computer vision to guide the landing, using a new technology called terrain relative navigation. SkyCam: A suite of weather instruments will include a sky-facing camera for studying clouds and the atmosphere. All these cameras will be incorporated as the Mars 2020 rover is built at NASA’s Jet Propulsion Laboratory in Pasadena, California. They represent a steady progression since Pathfinder: after that mission, the Spirit and Opportunity rovers were designed with 10 cameras each, including on their landers; Mars Science Laboratory’s Curiosity rover has 17. The cameras on 2020 will include more color and 3-D imaging than on Curiosity, said Jim Bell of Arizona State University, Tempe, principal investigator for 2020’s Mastcam-Z. The “Z” stands for “zoom,” which will be added to an improved version of Curiosity’s high-definition Mastcam, the rover’s main eyes. Mastcam-Z’s stereoscopic cameras can support more 3-D images, which are ideal for examining geologic features and scouting potential samples from long distances away. Features like erosion and soil textures can be spotted at the length of a soccer field. Documenting details like these is important: They could reveal geologic clues and serve as “field notes” to contextualize samples for future scientists. Their lenses will also have a wider field of view. That’s critical for the 2020 mission, which will try to maximize the time spent doing science and collecting samples. There’s a challenge in all this upgrading: It means beaming more data through space. To address that problem, rover cameras have gotten “smarter” over time — especially regarding compression. NASA has also gotten better at using orbiting spacecraft as data relays. That concept was pioneered for rover missions with Spirit and Opportunity. The idea of using relays started as an experiment with NASA’s Mars Odyssey orbiter, Bell said. NASA plans to use existing spacecraft already in orbit at Mars — the Mars Reconnaissance Orbiter, MAVEN, and the European Space Agency’s Trace Gas Orbiter — as relays for the Mars 2020 mission, which will support the cameras during the rover’s first two years.